I have traveled to London on several occasions, and I have enjoyed myself every time. There is so much to see and experience, and when leaving, I have always wished I could stay longer or come back as soon as possible. The museums, the historical sights, and of course, shopping, has all made me in love with this European gem. One little thing has grown to my heart instantly - the traditional tea drinking. The tea I have drunk and the way they served it left me in love with this English social custom. I have decided to bring this tradition into my home, and as soon as I have returned, I started my quest for the best tea kettle. Now I have perfect tea parties with my lady friends! What Should You Look For In A Tea Kettle For Gas Stove? As simple as this question sounds, in reality, there are various kettles on the market that do not perform well on gas stoves and should be avoided. The high temperature and the direct contact with the flame produced by gas can make some kettles crook, flake or even crack. So it is important to decide upfront if you are going to use the kettle on your gas or electric stove. And if you want to get informed about the best gas cooktop you can get, look it up in gas stove reviews or browse the sites that have a broad range of stovetops﻿ for sale. Fortunately, some kettles are designed to be used on the gas stoves, and it is usually stated by the manufacturer on the package, if you cannot find that information yourself, you can always seek guidance from the seller. The tea kettles made in the USA are hard to find but do not let that disappoint you since It does not mean poor quality. For example, my friend owns a Japanese teapot that is quite unique, and mine are all made in China. The top three things you should pay attention to when you look for the best stovetop tea kettle for your gas stove are the materials it is made of, the thickness of the bottom and the design. 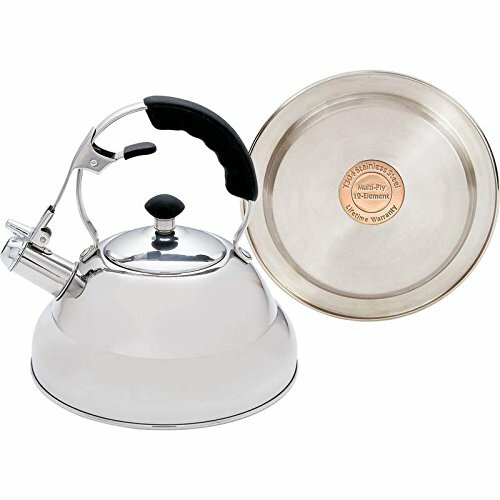 Firstly, as far as material is concerned, kettles are usually made from ﻿stainless﻿ steel, aluminum, copper, and cast iron. Believe it or not, there are even glass tea kettles. Aluminum kettles are light and do not damage easily, copper ones are bit more difficult to maintain since they tend to tarnish, and cast iron kettles are pretty heavy and hard to clean unless covered with enamel. Enamel teapots are prone to flaking and chip quite quickly. They all have their good qualities, but stainless steel tea kettles are the most popular by far. They are shiny, modern-looking and widely available, but also durable and easy to maintain. For this reason, all the products I have included in this buying guide are the stainless steel kettles. Also, be sure to pay particular attention to the bottom of the kettle, as the best tea kettles have a specially designed and rather thick base to be able to withstand the direct heat of the gas cooktop. Finally, we reach the design of the tea kettle. And, believe me, it is one of the main reasons why you should buy a tea kettle in the first place. There are so many designs that you can choose from and incorporate into your kitchen. You can find cute tea kettles that will inspire your children to start drinking tea, but also unique tea kettles that express your personal style. Whatever design or material you choose though, make sure that it whistles because if it does not, you will not be able to have the complete English experience. The whistling is a trademark of tea kettles, and without it, they would not be the same. On the other hand, some models can be manually adjusted and are convenient for those who sometimes need to enjoy their tea in silence. Tea kettle whistling is music to my ears, but I wish I had the silent one when my son was a baby, and I had to run like a madman to remove the kettle from the stove not to wake him up. If you are wondering how to clean a tea kettle, I have a perfect solution! Tea kettles are mostly used for boiling water and usually only need to be rinsed after use, or in time the limescale will accumulate. I have had that problem myself and therefore devised a sound way to clean it without the damaging chemicals. First of all, rinse the kettle with warm water. Secondly, add the juice squeezed from one lemon or lime and fill the rest with water. Be careful not to cross the fill-line. Let it boil in the morning, and after that, rest it for one more hour or so. Empty the content and rinse well. Your tea kettle should be as good as new! To avoid the residue from forming avoid leaving water in the kettle when not in use. Do not use abrasives or harsh chemicals to clean it. You can even avoid using soap altogether and clean it with vinegar and salt mixture. Rinse the kettle after every use and do not use it to boil anything but water! Never put the tea bags or herbs into the kettle or the interior might change the color. This kettle has made me fall in love at first sight. 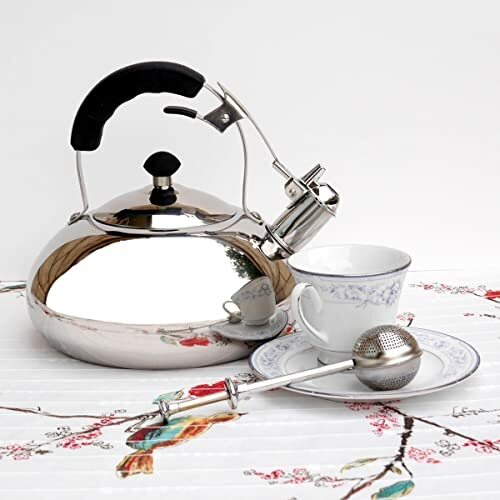 I could immediately see myself hosting a tea party and showing off to my friends with this shiny and perfectly polished stainless steel tea kettle. It looks so good that you can leave it out in your kitchen as a decoration! It is very practical to use thanks to the rubber-coated handle, a rubber add-on on the lid, and the spout, which all prevent you from burning your fingers. It fits well in hand, and the spout trigger can be easily reached without having to put your hand in the way of the tremendously hot steam coming out of it. 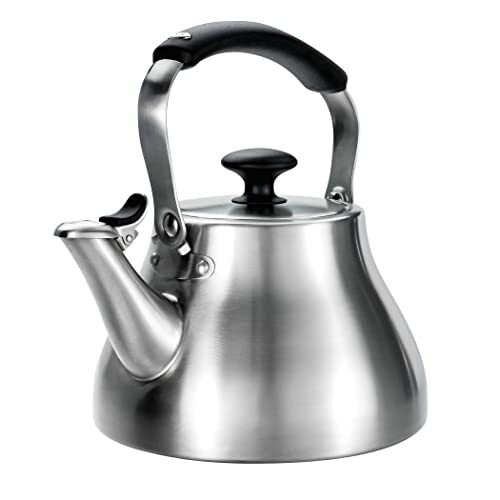 Moreover, I have found this stovetop tea kettle highly suitable for use on a gas stove. It has a large base that heats up quickly, and the water is therefore boiled in minutes and stays hot longer. It fits well on the burner (although you must use the larger burner), and you do not have to worry that it will overturn if you fill it up. Finally, its size is great if you have friends coming over for a tea party and a little chit-chat. I have tried it out, and it has proven to be easy to use as the water does not spill when pouring. I personally enjoy using this kettle, and I think it is certainly one of the best whistling tea kettles for the gas stove which can also be used as an induction tea kettle. The first thing you'll notice about this Vescoware whistling tea kettle is how gorgeous it looks. The design is a bit retro, and if you love that mix of vintage and modern, you will certainly appreciate this kettle. One can notice right away that it is a quality-built appliance. Its polished finish has not been scratched during my several weeks of use. The high-quality stainless ﻿steel should be rust free for years. 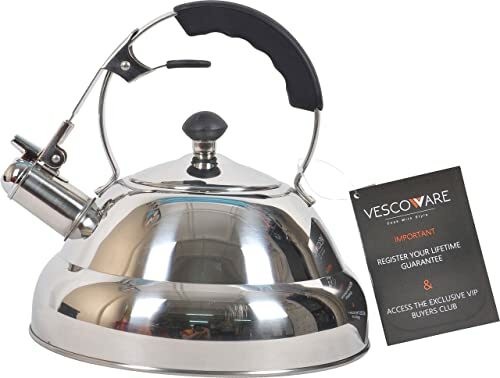 Also, this Vescoware tea kettle has a flat multi-ply bottom made of metal layers with aluminum, surrounded by stainless steel; it spreads the heat evenly and very fast. Personally, I was impressed with the ergonomic silicone handle and trigger cover which permit me to manage the tea kettle with my bare hands regardless of the heat buildup. Have so far used it on my KitchenAid electric stove, my induction cooktop and as a camping tea kettle and it always worked wonders. It is advertised as 3 liters or 3.2 quarts, but I have found that it sprouts water if I pour more than about 2.6 quarts so have this in mind if you are looking for that specific capacity. As far as the design is concerned this is my favorite one! It looks fun, and the red color makes it pop-up in the kitchen. It reminds me of a stylish English tea kettle I have seen in London. Everyone notices it, and I have received many compliments on it. Another great thing is that it works well on every stove type. This tea kettle is advertised as being made of the premium stainless steel used in the aviation industry, and since the manufacturer offers a no-hassle 30-year money back guarantee it might be true. It is reasonably priced and highly appraised in tea kettles reviews I have read so far. 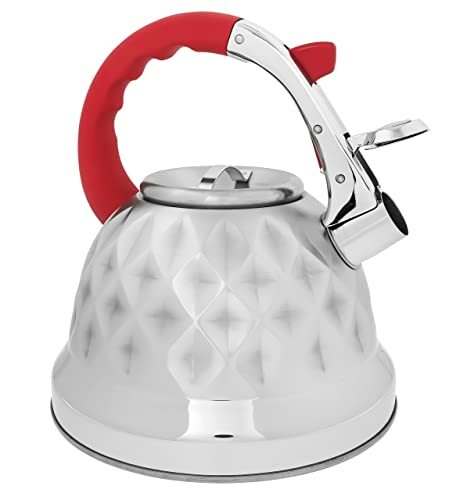 Although larger than most, this red tea kettle is very lightweight. Honestly, it was relatively easy to handle the 3.2-liter weight of water. When it reaches the boiling point, its whistle is deafening and can be heard throughout the house. On the downside, the handle can get quite warm, and the lid gets sizzling hot, so you have to be quite careful not to touch it, but this is especially hard if you have large hands as my husband does. He has had some stressing moments when making us our morning tea. You can solve this problem though if you use a potholder. This classic-looking tea kettle for glass top stove has not performed well in combination with my KitchenAid induction range. The problem is at the bottom as it doesn't have the mass required to heat up properly on an induction top. It does eventually heat up, but it vibrates a lot in the process. Another issue that I have had, and is far more important, is that it showed some rust on the inner part of the top lid after only a few weeks of moderate use. To be honest, I did leave the water to sit in the kettle for a few days, but I have not had this problem with other kettles yet, and I do that all the time. Whistle not very loud, and that can be both good and bad depending on your needs, it can be heard if you are near but I could not hear it from another room with the doors closed. On the plus side it holds as much water as advertised since it appears as a rather small tea kettle, it seems quite unbelievable. I am sorry to say that I would not recommend this kettle. The design of the OXO tea kettle is very traditional or better to say, rustic. It would fit perfectly into a cottage in the mountains that my family visits often. The seamless bottom seems thick enough to be used with the gas stove. ​​​​​I have already used it on several occasions, and I can honestly say that their handle design is a piece of a miracle; it can be turned down and removed from the way when you fill the water in or when you need to clean the interior. Moreover, the silicone touches points on the spout cap and handle help resist heat. You have an option to flip the spout cap down and have it whistle when water is boiling, but you can also leave it uncovered and avoid the pitching sound. It seems solid and durable, and so far I have not experienced any problems or seen any traces of rust. On the downside, the lid fits too tightly and I sometimes have trouble taking it out, especially if the kettle is hot. I also do not like the fact that it cannot be used with the induction hotplate, because I like to have that option available. My personal favorite is Chef's Secret KTTKC Surgical ﻿Stainless﻿ Steel Tea Kettle. It is simple yet unique, and I think it will prove to be the most durable as the copper capsule bottom will last forever. Which is harder to clean, the plastic kettle or the stainless one? I can’t choose between the two types. Planning to get one soon but I’m still looking for some reviews about Ovente brand. Dear, all the kettles I have reviewed are stainless steel for a good reason – they are the easiest to take care of.